Ramblings from a mother of 1 (& one on the way) who longs to be a stay-at-home mommy one day. Ok, so I might be overreacting a little bit, but this Swine Flu thing is scaring me to death! I guess the fact that I have a 2 year old at home & I am 6 months pregnant doesn't help the matter either. The media keeps reporting how dangerous this flu is & I keep hearing how pregnant women should be extrememly cautious because our immune systems are so low during pregnancy. Kind of makes me just want to stay in my house all the time! I really don't want to catch this thing & certainly don't want my family to catch it either! Please be cautious while out in public & use plenty of sanitizers & wash your hands frequently! Also, avoid anyone who is coughing, sneezing, etc. And be sure to get your flu shots! 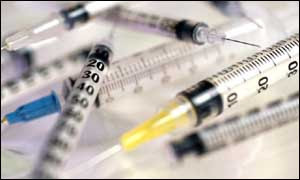 The Swine Flu shot should be ready in October! You can't be too careful! It's Tuesday...but today is my Monday since I work Tuesday through Thursday. Yuck...I hate Tuseday's. I miss my girl today. Had 4 funtastic days with her & I was not looking forward to coming back to work today. At least today means I have Wednesday & Thursday & then I have 4 more funtastic days with her!!! We had a great weekend this weekend. Mr. Coach & I finally got to clean out the closet in the 3rd bedroom which will serve as the new nursery! I have been begging for weeks to get him to help me do this, since most of the things piled in the closet belonged to him anyway (football books, etc). I feel like I got a lot accomplished as far as cleaning goes this weekend. Got a start on the nursery. Now to finish cleaning it out (it has been our "office" up until this point), move all of the "baby" things out of our oldest daughter's bedroom to the nursery & paint! I feel like we have sooooo much to do before this baby gets here, but I do feel like I accomplished a little on getting started this weekend so that makes me feel good! Mr. Coach's football team won their Jamboree game Thursday night! YAY!!!! They looked really great for their 1st "game" of the season! The 1st "official" game of the season is this Friday! I hope they can keep it up! Maybe the rain will stay away so we can make it to this game. Had to sit at home & watch it on t.v. (thank goodness) last week because of the storms here in Birmingham. Saturday we got to spend a little quality, family time together (which is very rare during football season...Mr. Coach works all the time). We got up and went to breakfast at IHOP! We really enjoy going to breakfast together on the weekends. It was really nice to get out & enjoy the beautiful day! We have FABULOUS weather in Birmingham this weekend! It was a small taste of Fall & it just made my weekend! This weather just puts a "spring" in my step! LOVE it! Fall can NOT get here fast enough! College football starts next weekend! I'm really looking forward to it! I hope our Auburn Tigers have a great season this year! Oh, saw the cutest shirts last Friday on these two cute little girls while having a "lunch play-date" with a friend at Chik-Fil-A (which was an absolute madhouse). The t-shirts had a the girls first name initial in a big letter monogrammed with their names smaller monogrammed behind the initial. It was super cute & I am thinking about getting one for my daughter! I love everything monogrammed! I would dress her in head to toe monogramming every day if I could! LOL! Anyway, over heard the girls mom say the shirts came from Fireflies & Fairytales in Lee Branch (one of my favorite kids stores). They have a lady there that monograms. Check it out! I have a link to their website on my "favorite links" section. Football Season is officially here! Yay! My husband (aka "Mr. Coach") is a high school football coach & tonight is their first game of the year, their "Pre-Season" game. It's always such an exciting time of year & also lonely because he is gone ALL the time. But he loves his job with a passion that I will never understand & I admire him so much for that! So, tonight I am wishing much luck to them in hopes of a BIG win! 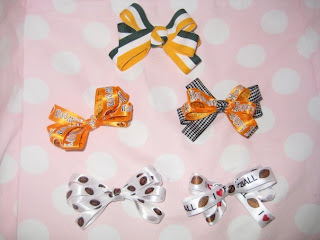 I came across some of the cutest ribbon at Hobby Lobby the other day for football season & Halloween & I thought I would try & make my daughter some hair bows. I mean how hard can it be, right? Well, here is my first attempt at making hair bows. I have to say, they didn't turn out as bad as I thought they would! Today I have been reminded of how dear our children are & how lucky we are to have these blessings! Today is the 26th birthday of a friends daughter who was killed in a car accident several years ago. Not only is that tragic, but she also lost an older daughter several years before that in a car accident as well. She has lost 2 children out of 3. I can not begin to imagine her pain on this sad but joyous day. My heart is heavy today as I remember her 2 girls, one of which I was a cheerleader with in High School. I thank the Lord every day for my sweet blessing & I hope & pray I never have to feel the pain my friend feels. Our children are blessings & we should cherish every single moment we have with them! I am a mother to one precious angel daughter & we have another on the way and I am a wife to a High School football coach! I long to one day be a stay-at-home Mommy, but until then I will settle for Part-time stay-at-home Mommy which is not so bad. Just A Little Something FABULOUS!